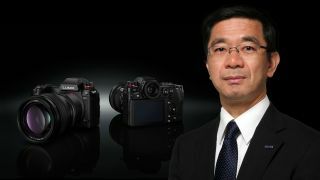 At the launch of the Panasonic S1 and S1R we had the opportunity for a Q&A session with Mr Yosuke Yamane, who is Director of Panasonic’s Imaging Network Business Division. We asked him questions about the Lumix S series, Panasonic’s recently announced 8K plans, the decision to stay with DFD autofocus and whether a large-diameter lens mount really is as important as some companies say it is? Q: Is the Lumix S designed more for stills photography, more for video or designed for both equally? A: We have over 40 years experience of professional video, so I think we have an advantage against the competitors, and in still pictures, we have a long experience of the Micro Four Thirds technologies, so convergence will come. I think our advantage can be used in the new generation, so the technology for the video, technology for the still image, and the convergency of these two technologies will be our advantage going forwards. Neither one is more important. Q: Have you found that professional photographers are increasingly having to shoot both stills and video? A: In the professional market, the trend for photographers to try to get into video is going to expand in the future. A lot of people are uploading video, so demand for high quality video is also expanding because they want to differentiate against other photographers. So there’s a kind of hybrid photographers’ trend; the still camera user trying to get into the video world and vice versa. Q: 4K video at 60fps, 6K Photo mode, these require very powerful image processing. Is this processing power the next technical hurdle in digital imaging? A: Not only do we emphasise the performance, but also the operability for content makers, which is and will be very important. For example, not only the 4K/6K, but also in the future in the 8K era, what kind of content should it capture? That might be the technology which we have to develop in the future. So currently, to cover a whole stadium, for example, we need several cameras, but in the 8K era just one camera can cover all the stadium, and pick up 2K content or 4K content from that picture, and that’s what we have to focus on. So the technology to increase the signal processing creates a new barrier. We want to be always one step ahead compared to the other competitors in this technology. Q: The news that Panasonic is developing 8k technology is very exciting. Can you say how soon this will happen? A: We are not sure we will answer your question! [Laughter] But 8K technology, an 8K product, is technically possible for us to launch. However, we have to investigate what kind of a value we can provide to the customer with an 8K product, and how they are going to utilise 8K content. So is this for business-to-consumer products or business-to-business? We need to find out a good application for 8K before we launch a product. So, between you and us, we have already started the key devices for the 8K product. So today we introduced the new 8K lens, which is ready to record 8K content already. And the sensor is also ready to record 8K [we understand Panasonic to be using the 47-megapixel in the S1R]. And we have already started the development of the signal processing engine. So I’m sure we can complete the development of an 8K product as some of the parts are ready to go already. We believe Panasonic's upcoming 8K product will use a version of the 47-megapixel sensor in the Lumix S1R. Q: Why has Panasonic chosen to stay with its DFD system rather than phase-detection autofocus? A: Autofocus includes the detection of the distance from camera to the object, and the focus movement to focus on the object. Both are a very important part of the autofocus. So for the detection part, contrast AF, phase detection AF and DFD, these three technologies are available right now, and at this moment we pursue a hybrid system with our DFD detection, and we are sure that this is competitive enough, at this moment. However, in the future, if we introduce not only one technology, but also two, three or four technology combinations, if they make the autofocus more precise, we are going to study whether to introduce some of this technology beside the DFD. So we always try to develop and make an evolution of the autofocus system. Q: We have heard some makers say a wide lens mount is important while another maker has said it is not – what does Panasonic say? A: Eight years ago we started the planning and development of full size mirrorless cameras, and at that time we had to choose the mount. A large mount diameter generates a good picture quality, but one more important thing is the operability – it should handle very easily. So the balance between the performance and the operability, that’s the most important thing that we have to think about. We think the L-Mount has the best and optimum balance between these two factors. Between Panasonic and Leica we have a contract for technical collaboration, so as a result of this collaboration the Leica L-Mount incorporated very high speed communication between lens and bodies. Thanks to the collaboration, we could evolve the L-Mount using Leica’s optical technology and our digital electronics technology and high speed communication. In this respect also the L-Mount has a big advantage. Our thanks to Mr Yamane for his time. When he entered Panasonic 30 years ago, Mr Yamane was an autofocus engineer. He also worked as an engineer for the image stabilization and the signal processing systems, so he has been working with a wide range of Panasonic’s technologies for a long time.